[S100] Obituaries from The Casket Newspaper, 1852 - present, Obituary of MacFarlane, Ronald, 75-1927-50-2. [S100] Obituaries from The Casket Newspaper, 1852 - present, Obituary of Dougald C. MacFarlane, 131-1983-29-12. [S709] Diocese of Antigonish, Nova Scotia, Canada , Baptismal record of Dougald Cameron MacFarlane, page 1. [S956] 1911 Canada Census, MacFarlane # 0684. [S100] Obituaries from The Casket Newspaper, 1852 - present, Obituary of Angus Cameron MacFarlane, 122-1974-1-15. [S815] J. Makowwiec, "Obit of Doug MacFarlane #2621," e-mail to e-mail address, 9/11/2013, Obituary of Doug MacFarlane. Biography*: Lillian did her training at St. Martha's in 1927. She was an RN living in New York at the time of her mother's death in 1962. She was still living in New York at the time of the death's of her brothers Angus Cameron in 1974, Ronald Allan in 1976 and John Andrew in 1981. [S767] Allan J. Gillis, Descendants of John "Blacksmith" Cameron, page 3. Ancestry.com.U.S. Public Records Index, 1950-1993, Volume 2[database on-line]. Provo, UT, USA: Ancestry.com Operations, Inc., 2010. Ancestry.com. New York, Index to Petitions for Naturalization filed in New York City, 1792-1989 [database on-line]. Provo, UT, USA: Ancestry.com Operations, Inc., 2007.2. [S100] Obituaries from The Casket Newspaper, 1852 - present, Obituary of Eunice MacFarlane, August 3, 1983. Ancestry.com. U.S. Public Records Index, 1950-1993, Volume 1 [database on-line]. Provo, UT, USA: Ancestry.com Operations, Inc., 2010. Original data: Voter Registration Lists, Public Record Filings, Historical Residential Records, and Other Household Database Listings. Biography*: A graduate of Hamilton Memorial School of Nursing, she pursued her career in New York City where she specialized in orthopedic nursing. She was living in New York at the time of her mother's death in 1962 and at the time of the death of her brothers Angus Cameron in 1974, Ronald Allan in 1976 and John Andrew in 1981. [S100] Obituaries from The Casket Newspaper, 1852 - present, Obituary of Eunice MacFarlane, 131-1983-48-15. Ancestry.com. New York, Passenger Lists, 1820-1957 [database on-line]. Provo, UT, USA: Ancestry.com Operations, Inc., 2010. THOMPSON (MacFarlane), Mary Camilla - We, the family of the late Mary Thompson, 90, Plymouth, Pictou Co., with heavy hearts, wish to announce the passing of our dear and beloved mother. Although her health had deteriorated in recent years, she remained a strong and vibrant source of strength and support for us all- her 11 children, her 39 grandchildren and 55 great-grandchildren, not to mention the many friends and children who used to visit her farm and came to call her "Nannie". She was also very committed to church and community. She was a member of Saint Gregory's Roman Catholic Church, New Glasgow, and the CWL. She was also a member of the Plymouth Golden Glen Club. In spite of a courageous effort, she succumbed to the illness, dying early Monday morning, surrounded by her loving family. Born in Williams Point, Antigonish Co., she was a daughter of the late Ronald and Anne Jane (Cameron) MacFarlane. [S429] Obituaries from The Halifax Chronicle Herald Newspaper, Obituary of Mary Camilla (MacFarlane) Thompson, June 27, 2000. 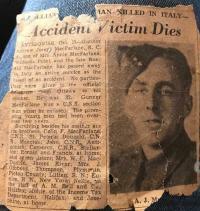 [S429] Obituaries from The Halifax Chronicle Herald Newspaper, Obituary of Clifford Gerald) Thompson, December25, 2000. [S767] Allan J. Gillis, Descendants of John "Blacksmith" Cameron, page 8. 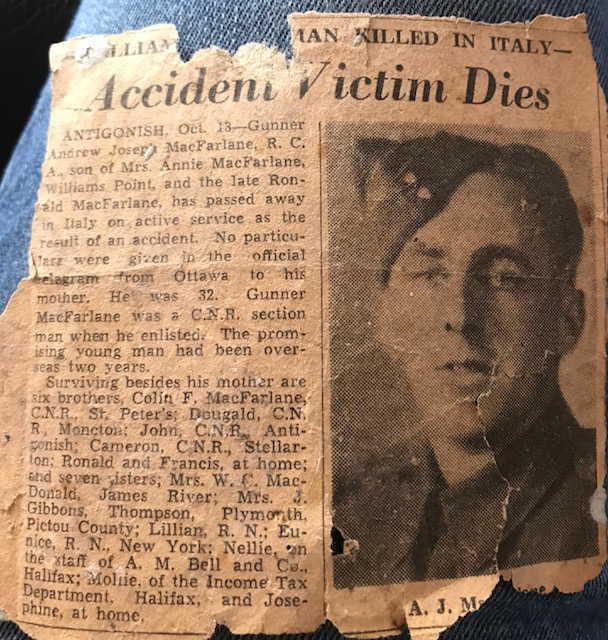 [S429] Obituaries from The Halifax Chronicle Herald Newspaper, Obituary of Clifford Gerald Thompson, December25, 2000. Biography*: Joseph was living at home at the time of his father's death in 1927. Library and Archives Canada; Ottawa, Canada; Service Files of the Second World War - War Dead, 1939-1947; Series: RG 24; Volume: 26458. Name Variation: Angus Cameron MacFarlane was also known as Camie MacFarlane. [S730] Allan J. Gillis, "Descendants of John Alexander (Jack Dan) Chisholm." [S754] Allan J. Gillis, Descendants of Angus Mor MacGillivray, page 28. [S298] Linda Cameron, "McCallum, Margaret Obituary," e-mail to Antigonish Genealogy List, October 27, 2000. [S341] Registration form to Gathering 2001 Committee, August 3, 2001, Sheet 70. [S260] Patrick/Peter MacFarlane, Typescript, c 1995 Donald James MacFarlane. Death*: She died on 19 January 2010 in R. K. MacDonald Nursing Home, Antigonish, Antigonish, Nova Scotia, Canada, at age 92; MacFARLANE, Anne Josephine "Tootsie"
Of Williams Point, Antigonish Co., died January 19, 2010 in R. K. MacDonald Nursing Home, Antigonish. Born July 29, 1917, in William's Point, she was the daughter of the late Annie Jane (Cameron) and Ronald MacFarlane. She was the last surviving member of her generation of MacFarlanes. She is survived by daughter Pat (John) Moffatt, Dartmouth; sons Bud (Barb), Truro: Tom, Antigonish; grandsons, Mark Moffatt; Bill, Kevin and Jesse Gilfoy; grandaughter, Kendra (Rob) Bougeois; great- grand-daughtersRachel and Kate Boureois; sisters-in-law Kitty MacFarlane and Joyce Chisholm; brothers-in-law Harold Gilfoy and Ralph McCallum. She was predeceased by her husband Bill Gilfoy; brothers Collie, John, Dougald, Josie, Camie, Ronnie, Frank; sisters Kitty, Lilly, Mary, Eunie, Tena, Jeannette, Mollie, Nellie. Visitation was held at MacIsaac Funeral Home, 61 Pleasant St., Antigonish. Mass of Christian Burial, Friday 11 a.m. in St. Ninian's Cathedral, Rev. Tom MacNeil presiding. Burial at a later date in St. Ninian's Cemetery. Family flowers only please. Donations to L'Arche, Antigonish or Martha's Place, R. K. MacDonald Nursing Home. Funeral services for the late Anne Josephine “Tootsie” (MacFarlane) Gilfoy, 92,William’s Point, Antigonish County, were held January 22 in St. Ninian Cathedral, Antigonish, with Father Tom MacNeil officiating, assisted by Father Alex MacKinnon. Burial will be in St. Ninian Cemetery at a later date. 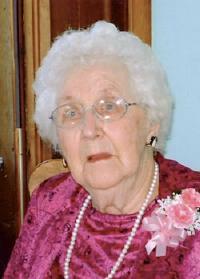 Mrs. Gilfoy died January 19, 2010, in the R. K. MacDonald Nursing Home, Antigonish. Readers at the funeral Mass were Janie Teasdale, Danny Gilfoy and Lynn MacFarlane. Margie MacDonald and Kendra Bourgeois presented the offertory gifts. Eucharist minister was Mary Lillian MacDonald. Music was provided by James MacPherson and Margaret MacDonald. Pallbearers were Colin MacFarlane, Kenny MacFarlane, Joe MacFarlane, Hal Gilfoy, Leonard Thompson and Roddy MacDonald. Born, July 29, 1917 in William’s Point, she was the daughter of the late Annie Jane (Cameron) and Ronald MacFarlane. She was the last surviving member of her generation of MacFarlanes. She is survived by her daughter, Pat (John) Moffatt, Dartmouth; two sons, Bud (Barb), Truro; Tom, Antigonish; four grandsons, Mark Moffatt, Bill, Kevin and Jesse Gilfoy; granddaughter, Kendra (Rob) Bourgeois; two great-granddaughters, Rachel and Kate Bourgeois; two sisters-in-law, Kitty MacFarlane, Joyce Chisholm; two brothers-in-law, Harold Gilfoy, Ralph McCallum. She was predeceased by her husband, Bill Gilfoy; seven brothers, Collie, John, Dougald, Josie, Camie, Ronnie, Frank; eight sisters, Kitty, Lilly, Mary, Eunie, Tena, Jeanette, Molly, Nellie. Biography*: Josephine was living at home at the time of her father's death in 1927. She was married and living in William's Point at the time of her mother's death in 1962 and the deaths of her brothers Angus Cameron in 1974, Ronald Allan in 1976 and John Andrew in 1981. She was living at Williams Point in February, 1997. [S704] Obituaries - The Reporter - Port Hawkesbury, Obituary of Anne Josephine "Tootsie" MacFarlane, January 2010. Ancestry.com. Canadian Phone and Address Directories, 1995-2002 [database on-line]. Provo, UT, USA: Ancestry.com Operations Inc, 2005. [S100] Obituaries from The Casket Newspaper, 1852 - present, Obituary of Annie Josephine Gilfoy, January 31, 2010. [S341] Registration form to Gathering 2001 Committee, August 3, 2001, Sheet 61. [S306] MacFarlane-Bowering, Brenda Obit, July 3, 2001. [S307] Archie Mills, St. Mary's Cemetery, Heatherton, NS, page 1. [S100] Obituaries from The Casket Newspaper, 1852 - present, Obituary of Archibald Mills, 51-1902-8-5. [S100] Obituaries from The Casket Newspaper, 1852 - present, Obituary of Ann Mills, 64-1916-52-5. [S709] Diocese of Antigonish, Nova Scotia, Canada , Marriage record of John McFarlane and Flora McIsaac, page 130. [S1141] 1891 Canada Federal Census, on-line. Birth*: A. was born circa 1820 in Nova Scotia, Canada. [S412] April 18, 1881 Canada Federal Census, 101 Newbury Street, Boston, Suffolk, Massachusetts, USA. Birth*: Angus was born circa 1820 in Nova Scotia, Canada. [S100] Obituaries from The Casket Newspaper, 1852 - present, Obituary of Christena Gillis, November 5, 1925. Birth*: Allan was born in 1820 in Nova Scotia, Canada. Year: 1871; Census Place: St Andrews, Antigonish, Nova Scotia; Roll: C-10562; Page: 31; Family No: 94. Birth*: Donald was born circa 1820 in Nova Scotia, Canada. 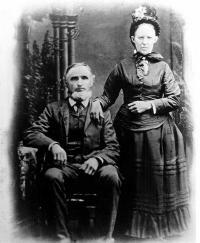 Marriage*: He married Isabel MacDonald circa 1870 in Nova Scotia, Canada. [S100] Obituaries from The Casket Newspaper, 1852 - present, Obituary of Sister M. Immaculata Fraser, February 5, 1976. [S1132] 1891 Canada Federal Census, on-line. [S1130] 1901 Canada Federal Census, on-line. [S1131] 1911 Canada Federal Census, on-line. [S100] Obituaries from The Casket Newspaper, 1852 - present, The obituary of Alexander Joseph Fraser, October 31, 1974. [S709] Diocese of Antigonish, Nova Scotia, Canada , Birth record of Alexander John Fraser, page 298. [S709] Diocese of Antigonish, Nova Scotia, Canada , Birth record of Hugh Fraser, page 302. [S709] Diocese of Antigonish, Nova Scotia, Canada , Birth record of Janet Fraser, page 302. [S709] Diocese of Antigonish, Nova Scotia, Canada , Birth record of Mary Margaret Fraser, page 303. [S709] Diocese of Antigonish, Nova Scotia, Canada , Birth record of Alexandre Joseph Frazer, page 303. [S709] Diocese of Antigonish, Nova Scotia, Canada , Birth record of Alexander Joseph Fraser, page 299. Birth*: Hugh was born circa 1860 in Nova Scotia, Canada. Religion*: Rev. Mother Immaculate Fraser was Roman Catholic. Sister M. Immaculata Fraser, 85, of the Congregation Of Sisters of St. Martha of Antigonish died on January 30 at the motherhouse, Bethany. Sister Immaculata had completed over half a century of active service within the congregation, and since her retirement to the motherhouse had been active in community endeavours. She had been in good health up to several months before her death. Sister Immaculata was born at South Side Harbour, the former Janet (Jennie) Fraser, daughter of John Fraser and Flora MacDonald of Cape Jack. Two brothers, Hugh and Alexander, are dead. She leaves only one sister, Mary Fraser, who is in a nursing home in Longuell, Quebec. Two nieces, Clare Fraser of the switchboard staff at Bethany, Jean Sherry of Halifax and nephew, Colin Fraser, also survive. Sister Immaculata, a graduate of St. Michael’s School of Nursing in Toronto, and St. Francis Xavier University, had training in Laboratory and X-ray technology and was a registered pharmacist. She was active in the field of nursing and allied services since 1920, serving as technician supervisor, administrator and building consultant in the hospitals for the congregation both in eastern and western Canada, and held executive positions in nursing associations. In 1937 she was elected superior general of the congregation for a six-year term. The Mass of Christian burial was held on Sunday afternoon in the Bethany chapel. The celebrant was Rev. John Barry, chaplain, representing Bishop William Power. The concelebrants were Rev. Anthony MacDonald, Rev. Clarence MacDonald, Rev. Angus MacDougall, Rev. Charles MacIsaac, Rev. John G. Webb and Rev. Lawrence Gillis. Father MacDougall was homilist for the occasion. Biography*: She was a member of the Sisters of Saint Martha. [S137] DOF - July 31, 1913, Boyd Settlement, July 31, 1913. [S682] Allan J. GILLIS (5174), "Descendants of Angus Boyd # 35620." [S682] Allan J. GILLIS (5174), "Descendants of Angus Boyd # 35620", Ref MacLean, vol I, page 103. [S597] Births at St. Andrews Parish Prior to 1850 entry, Excel spreadsheet (4/10/2007). [S709] Diocese of Antigonish, Nova Scotia, Canada , Baptismal record of William Boyd, page 182. [S709] Diocese of Antigonish, Nova Scotia, Canada , Baptismal record of Angus Boyd, page 228. [S709] Diocese of Antigonish, Nova Scotia, Canada , Baptismal record of Hugh Boyd, page 233. [S709] Diocese of Antigonish, Nova Scotia, Canada , Baptismal record of John Boyd, page 235. [S709] Diocese of Antigonish, Nova Scotia, Canada , Baptismal record of John Boyd, page 236. [S709] Diocese of Antigonish, Nova Scotia, Canada , Baptismal record of Mary Boyd, page 237. [S709] Diocese of Antigonish, Nova Scotia, Canada , Baptismal record of Margaritan Boyd, page 456. Year: 1891; Census Place: Pomquet, Antigonish, Nova Scotia; Roll: T-6308; Family No: 155. Year: 1911; Census Place: 14, Antigonish, Nova Scotia; Page: 17; Family No: 142. Birth*: Mary was born circa 1850 in Nova Scotia, Canada. Marriage*: She married Mr. Smith in Nova Scotia, Canada. Married Name: Her married name was Smith. Marriage*: He married Mary C. MacDonald in Nova Scotia, Canada. Birth*: Mr. was born circa 1880.